Book(ed) Passage: Smart Girls Like Me, at Book Passage on Thursday! Smart Girls Like Me, at Book Passage on Thursday! So I'll be reading at Book Passage this week, and I'm so excited, not least because it means phase one of the cross-country book tour is complete. I have basically eaten nothing but M&Ms, Pringles and Cherry Coke Zero (which, by the way, is amazing, and quite possibly the best diet soda beverage on the planet) for the last two weeks, and obviously, the human body cannot sustain such conditions much longer than this. I'm reading in Portland tonight, and then it's home to the Mission and Book Passage. Hurrah! I've been given this space for the next couple days, which is excellent, as it sort of pre-empts the whole Q+A portion of the reading - which is actually, usually, my favorite part, but can get a bit wander-y if I'm wiped out from, say, 16 hours of driving and a diet of sugar, artificial sweeteners, and reconstituted potatotes. (Yum, etc.) As I usually blog about such pressing issues as the difference between a belted cardigan and a sweater coat (short answer: none that I can discern), this should make a for a pleasant change. Q: What do you find inspiring? Q: So you think your book is as valuable a contribution to the art world as The Wire? You think you're as funny as Ricky Gervais? And it's just, like, er ... no. I don't. I'm just doing my best. Anyway. I was thinking we could exorcise this demon by ... talking about it even more! Instead of me going on about my book - come to Book Passage for that, on Thursday! - I thought we could talk about inspiring things in other media - because I do think that cross-pollination can be really exciting, and also liberating - sometimes there's nothing as depressing \ debilitating \ wonderful as reading something brilliant because you - or at least I - see the distance, so clearly, that needs to be covered to get to that place. But I don't paint. I barely draw. So when I see a painting like this, it's only as an observer, not a participant - or, in a more sinister sense, as a would-be competitor. 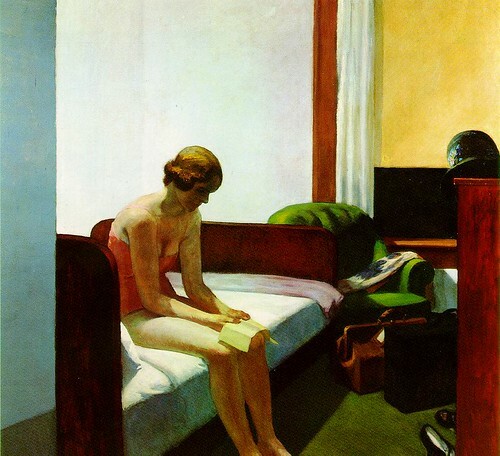 What I love about Hopper - and I do; he's the reason, really, why I came to San Francisco two years ago to study art at SFAI - is the sense of narrative - he really is the narrative person's painter. Who is this girl? Where did she come from? Where is she going? It's a vulnerable, private moment - her shoes are kicked off, her chic hat's been put aside. I spend a lot of time in hotel rooms, and that complicated, twinned feelings of ... freedom and isolation, they're both in there. I'm writing this post in a hotel room, and they're here. (With the Pringles slowly but surely raising my cholesterol at the same time.) When I see this Hopper, I start asking myself questions, questions of before and after, which are really questions of plot. And also of the moment: This quiet, private moment becomes a pivotal one. What other unexpected moment could provide such a window? And also: Even though there's an element of voyeurism to this image, it's not a pervy voyeurism: You can't see her face. Her pose is a private, non-sexualized one. At least, I don't read it as sexualized. If there's one thing I learned in art school, it's that if you look long enough, you'll find something that makes you, for tragic lack of better phrasing, feel alive. This does that for me. I feel connected to it. Just like with stories I love most, this encapsulates a feeling I have difficulty expressing myself. I'd love to know what paintings do that for anyone else out there. And by the way, anyone reading this from D.C. should be sure to stop by the National Gallery, if you haven't already, where this lovely painting is currently hanging, on loan from the Thyssen in Madrid.